The Nursing Professional Practice Models (PPM) at UCLA Health outline how nurses practice, collaborate, communicate, and develop professionally to provide quality care. At the center of our PPM is our commitment as nurses to the patient, family and the community. At UCLA Health our mission, vision, values and C-I-CARE sets the standard of organizational behavior for each nurse and is embedded in how we practice with each patient, the family and with colleagues. The Relationship-Based Care (RBC) Delivery Model supports the delivery of the Professional Practice in nursing. 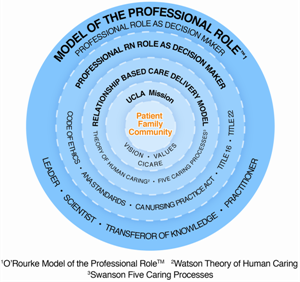 This circle represents the professional nurse role as a decision maker guided by the California Nurse Practice Act, ANA Scope and Standards of Practice, and the ANA Code of Ethics for Nurses. The outer circle is the O'Rourke Model of the Professional Role™ that defines the professional role as an integrated set of four role components that include the role of a leader who is a self directed decision maker, a scientist, a transferor of knowledge and a practitioner.